opposite Patti Lupone. He starred opposite Petula Clark in Sunset Boulevard, opposite Keith Michell in Aspects of Love, and with Marlo Thomas in Six Degrees of Separation. 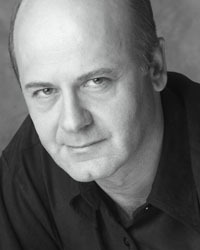 He appears in seven feature films including Kissing Jessica Stein, and often on television's "Law and Order". He's played over 160 roles in regional theatres, as well as many Off-Broadway productions. His Seattle appearances include five shows at the 5th Avenue Theatre: Sunday In The Park With George, Memphis, Cabaret, Into The Woods, and "Sweeney" in Sweeney Todd (receiving a Footlight Award for Stellar Performance). He appeared in The Clean House and (as Scrooge) in A Christmas Carol at ACT Theatre; Uncle Vanya and Richard III (Intiman); Proof (Tacoma Actors Guild); and Opus and Private Lives (Seattle Rep).